Here you willd find espresso cups made of high quality porcelain and of glass. 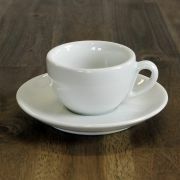 The italian espresso cups from IPA given an authentic feeling. Loveramics produces beautiful cups in a wide range of colours. 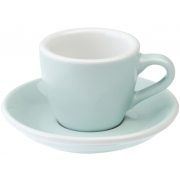 An espresso cup is traditionally made of heavy porcelain, which is good for storing heat. In italian cafés, the cups are stored on top of the espresso machine where they heat up and are ready for use. At home, it is recommended to heat up the espresso cup before use. A cold espresso cup cools down the espresso shot in no time!